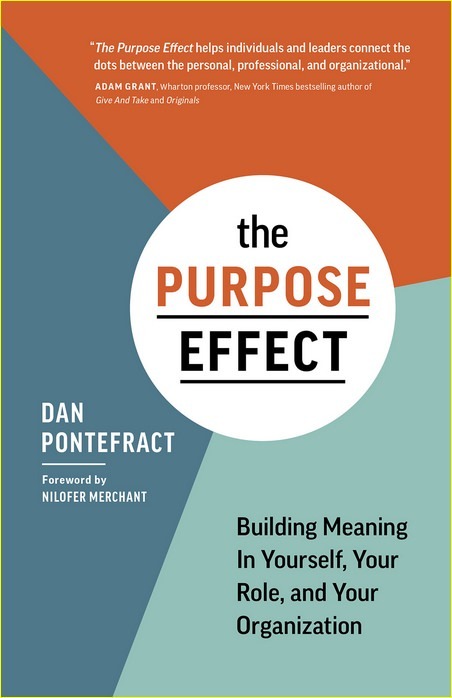 Pontefract combines years of experience and research on employee engagement, behavior and culture to create a work about the three crucial areas of purpose: personal, organizational and workplace role. If all three can come to fruition-if there is a positive interconnection between the three distinct definitions of purpose-the benefits should be felt by employees, teams, the organization, customers, and perhaps most importantly, society as a whole. We can refer to this balanced state as the "sweet spot." When one area is lacking or ignored the results range from disengagement, apathy, lack of growth and even bankruptcy. The Purpose Effect is aimed at both leaders and employees who wish to achieve a purpose mindset on a personal level, for the organization where they are employed and in their role at work, too. A business leader that is committed to purpose will create purpose for the organization. An employee that feels his/her personal sense of purpose is being fulfilled at work will be an invaluable asset to productivity and success. An organization centered on purpose will benefit every stakeholder, from employees to society in general. This "sweet spot" of purpose creates a reciprocal relationship between all three areas and sits at the center of Pontefract’s work.